Forever stuck in the shadow of his (almost) perpetual employer, Duke Ellington, Johnny Hodges was nonetheless one of the most widely-admired sax players of his day. Hodges was born in Cambridge, Massachusetts on July 25, 1906 and died unexpectedly of a heart attack while having dental work done in New York City on May 11, 1970. When he was 14 years old, Hodges began playing the sax, encouraged by a visit from the legendary Sidney Bechet, whom his sister knew. Some sources say Hodges took lessons from Bechet; others are silent on the subject. Whether he was self-taught or took lessons, he soon became good enough to play private parties for money. In 1928, he joined the Duke Ellington Band, and except for a brief period (from 1951 to 1955), he stayed with the Ellington group for the rest of his life. Despite his nearly constant employment with Ellington, Hodges found plenty of time to play with other jazz greats. Examples include Lloyd Scott, Billy Strayhorn, Chick Webb, Oliver Nelson, Lawrence Welk, Lucky Roberts, and of course, his idol, Sidney Bechet. This album was recorded in two sessions: February 6, 1964 (tracks 1-8) and March 8, 1965 (tracks 9-16). The personnel for these sessions were as follows. 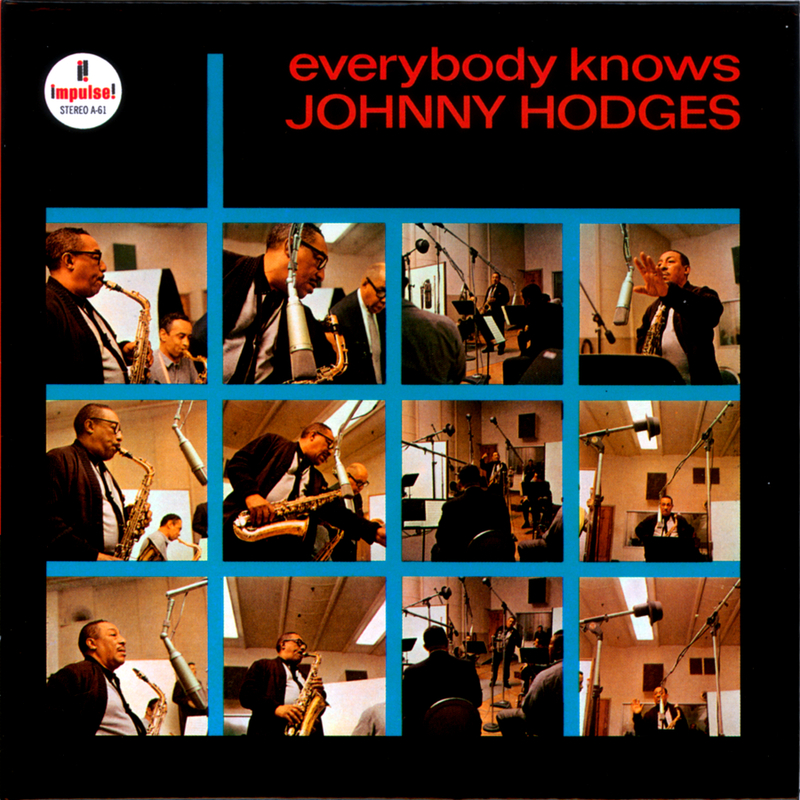 “Everybody Knows Johnny Hodges” is an expansive album, presenting us with no fewer than sixteen songs. Many of those are of short duration, running only three to four minutes. And even though only two pass the five minute mark, the CD version of the album, taken as a whole, runs over 69 minutes. We start with the lively title track, Hodges’ “Everybody Knows.” This is the longest song on the disk, running about 7:30. It is also a song that is easy to like. Horn solos abound, to the point where it is a surprise when we hear Jones and his piano take over. Through it all Tate and Shepard lay down a hot groove that keeps everyone grounded. The solos end at about the 6:20 mark and all those horns take it to the end in magnificent style. Billy Strayhorn’s “A Flower Is A Lovesome Thing” is next. Pianist Jones opens it with a few quiet notes that set the stage for the horns to make a discreet entrance. “Flower” is a beautifully mellow song with a touch of what might be melancholy. It’s perfect for late nights when the lights are low. Another Hodges original, “Papa Knows,” follows. This one isn’t exactly a barn burner, but instead derives its energy from five horns blowing, both simultaneously and solo. Shepard, Tate and Jones seem to be along for the ride on this one, which I suppose is the usual fate of the rhythm section, but they do their job well and lay down a nice base groove for the others to follow. “310 Blues,” another Strayhorn masterpiece, turns up the heat and the pace and helps plant this disk squarely in jazz for a Saturday night territory. The one drawback to this song is the fact that it sounds at times like a 1940’s swing number. Now I have nothing against swing, but this was recorded twenty years after swing had had it’s time in the sun. A little update on the arrangement might have been in order. Regardless of that, “310 Blues” is still a happy, lively song. “The Jeep Is Jumpin'” is our next number. From the combined pens of Duke Ellington, Strayhorn, and Hodges, this (along with the aforementioned “310 Blues”) is one of the many classic songs to come out of the WWII era. Despite the dated arrangement, this song cooks. Because I am running behind (surprise) I am going to skip ahead to track 11, “Good Queen Bess.” This is yet another Hodges original, and I dare say it will have you nodding your head, tapping your toes, or using some other body part (ahem) to keep time. This is a deceptively simple-sounding song that nonetheless will hold your attention from start to finish. The final song I’m going to mention was the result of another collaboration between Ellington and Hodges, the intriguingly named “Ruint.” This is a short (3:27) tour de force that will have you once again shaking or bobbing those body parts. An absolutely wonderful song, wonderfully presented! “Everybody Knows Johnny Hodges” will make a stupendous addition to your personal playlist, for a Saturday or any other night! To learn more about Johnny Hodges and his music, Wikipedia has a nice bio of him. It is probably based on the allmusic.com bio, but without the irritating videos that allmusic insists on running automatically and are almost impossible to shut off. Musician and prolific writer Dean Alger has penned another good bio of Hodges which you can read on the jazz.com web site. The online Encyclopaedia Britannica has a bio of Hodges also, as does BBC Radio3.